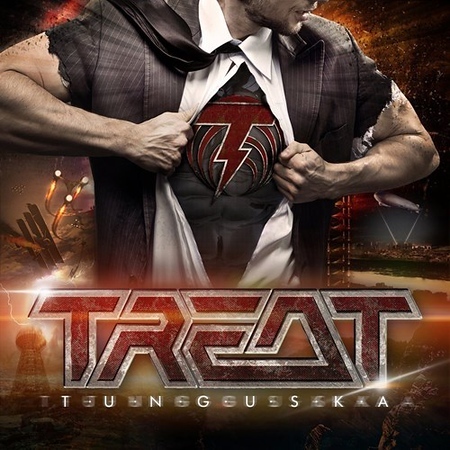 Treat was formed initially in 1981 by vocalist Robert Ernlund and guitarists Anders Wilkström and Leif Lijegren. The latter left the band in 1988 but the other two remain with the band, although Ernlund was replaced by Mats Levén between 1991 and 1993 when the band split up. The band’s debut album, “Scratch and Bite”, was released in 1985 and followed by further albums in 1986, 1987 and 1989. Levén sang on the self titled album released in 1992. Treat’s commercial success came with the first two albums and the latter releases did not do as well, leading the band to call it a day in March 1993. By that time drummer Jamie Borger and keyboard player Patrick Applegren were part of the band. A successful greatest hits release in 2006 called “Weapons of Choice” led to the band members deciding to reform and they played the Sweden Rock Festival that year. Ernlund, Wilkström, Borger and Applegren were joined initially by Nalle Påhlsson on bass. The latter was replaced in 2012 by Fredrik Thomander and he in turn was replaced by Pontus Egberg in 2016. The first album to be released after the band reformed was “Coup de Grace” in 2010.